In addition to having just celebrated my birthday this week, I’m also celebrating my one year healthy hair care anniversary. It got me thinking whether all this effort and work has been worth it and how much my hair has actually been growing over the last year. I have to admit there definitely are times when I wonder if my hair is growing at all. Even though I know it’s doing its thing, I know I can’t be only the one who thinks like this occasionally. So I decided to to do a comparison of pictures taken round about the same time a year apart. Lo and behold, look at how far it’s come! At first I wasn’t sure if there was much of a difference and I even had to ask my sister if I’m imagining things. 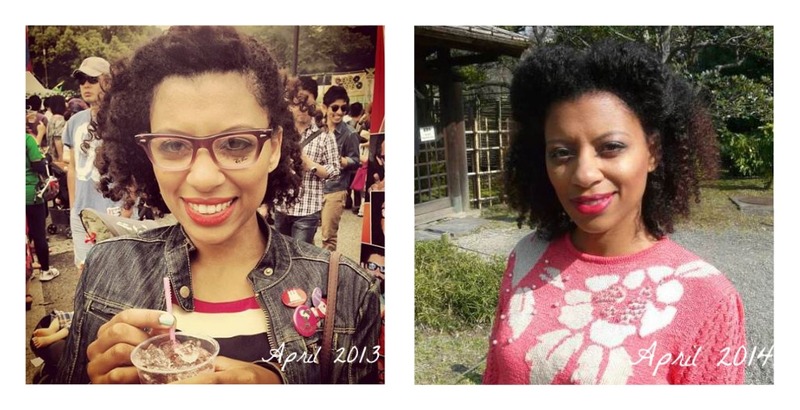 In the picture on the left taken in April 2013, my hair is in a twist-out (one of the first I ever did) and in the second picture on the right, I’m also sporting a twist-out. In both pictures I have the hair in the front pinned up. The truth is that I experience a lot of shrinkage which is why there isn’t a big difference in the actual length however, there is a huge difference in volume. In the April 2014 picture my hair is a lot thicker and bigger, which to me means there is a lot more hair. That makes me incredibly happy. I do hope this post serves as a little bit of inspiration to you if you are still early on in your healthy hair care journey, or simply if you feel like you are stuck in a rut. It made me realise again that our hair doesn’t all grow at the same pace – for some it’s faster, for some it’s slower and it is a case of just being patient. Obsessing over length won’t do you any favours, as it really is like watching paint dry. Just place the focus on healthy hair, and the length will follow. If you have ever felt frustrated with the time it takes your curls to grow, please comment below and let me know how you deal with these moments. I would love to hear from you. Thanks for the extra confirmation! Hey Kiddo! Thank you for inspiring me to go natural. You’ve also seen my growth over the past 7 months, but I’m just glad that my hair stays on my head nowadays instead of on my pillow case, my hair brushes and my dressing table, LOL! Thanks for the motivation, I was wondering about my hair growth myself, but like they say, a picture speaks 1000 words.